Normally, I wouldn’t consider bananas to be the kind of fruit that you chop up and mix into baked goods. The soft, velvety texture of bananas seems to lend itself to mashing. But I broke tradition and chopped them up before I added them to these scones. I felt that the texture of the scone would be compromised if I added all that excess moisture. Not that there is anything wrong with a muffin-like scone, but I wanted the hint of flakiness that rubbed in butter gives these to be noticeable. 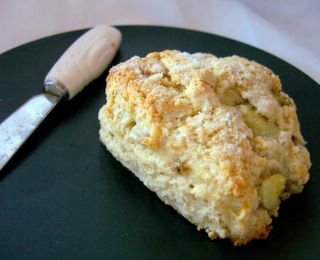 Butter is probably the most dominant flavor in these scones, accentuated by bites of banana and a kiss of vanilla. The ginger adds a very subtle flavor, but doesn’t draw much attention to itself, which is why I think it works so well here. If you want to play it up a bit, stir in some diced candied ginger along with the bananas. These scones develop a nicely crisp outside with a moist interior. The banana bits seem to caramelise a bit and lend a lovely flavor to the whole scone. In fact, the softness of the banana almost eliminates the need for anything like honey or cream to accompany these. But if you want to use a bit of extra butter, I won’t tell. In a medium bowl, whisk together flour, sugar, baking powder, salt and ginger. Cut butter into a few chunks and rub it into the flour mixture with your fingertips. Mix milk and vanilla in a small glass. Pour about 4 tablespoons into the flour mixture and stir until the mixture starts to come together. Add the banana chunks and continue to stir, adding more milk if necessary, until dough comes together. Pat dough into a disk about 1 inch thick. Cut into four sections with a knife and place each on baking sheet. Bake at 400F for 17-20 minutes, until light gold. Cool on wire rack or eat warm. These scones are best the day they are made. I’ve wondered about doing that myself – when you have a nice, not overripe banana, the idea of mashing it is a little sad. How did the banana pieces look? Did they become discolored? Hi Cathy. They weren’t discolored at all after baking or on the first day (you can see some banana bits on the right on the photo), though they were a bit browner on the second day. These look gorgeous, Nic. The perfect crumbly texture. Sigh. Maybe I could try them with gluten-free flour? Fran – Thanks! It’s definately a nice change from dried fruits or berries in scones. Shauna – I think they’re worth a shot with gluten free flour. I tried them with oat flour (admittedly combined with wheat flour), but the result was more of a cookie than a scone. A tasty cookie, but still. Nic, I love a good scone, but like you, I would have never thought of putting bananas into one. This sounds delicious, though – and with that candied ginger option, outrageously delicious! Thank you for a great idea. I loved your idea. I made mine tiny and couldn’t stop making tea to drink whilst eating the scones. I’m originally from Brazil and we love baking with banana.If anything they are dead cheap over there. I now live in the UK and scones are big here.Yours are just fab! Thank you. I was intrigued by this recipe. I mean, how many times can you make banana bread? And, I HATE throwing out food, so I was excited to find an interesting recipe for bananas. They turned out GREAT! I sprinkled a little turbinado sugar on the top before baking. They turned out slightly crisp on top, just the right amount of sweetness. Yummy!!!! I made these this morning and they were delicious. I added chopped dates and sprinkled cinnamon sugar on top. Thanks for sharing this wonderful recipe – I’ll definitely be making them often!